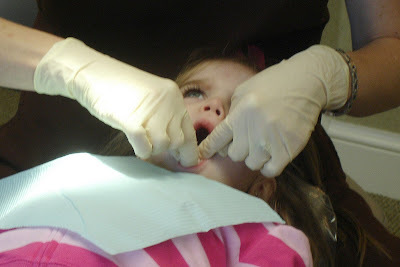 Since Ella is now three, she gets to go to the dentist! She had her first appointment today. I was bracing myself for a screaming fit, but she was actually very brave! The hygienist did say though, “I can tell this one is hard, isn’t she?” (She could only get 2 out of the 4 x-rays done and Ella kept closing her mouth during cleaning.) But, the trip was successful in my book because she didn’t throw any tantrums! 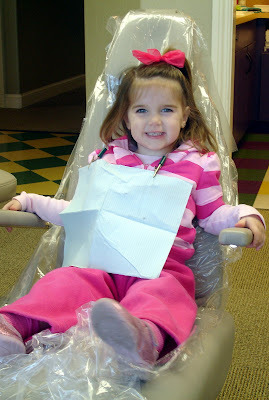 When the hygienist asked what flavor she wanted for the cleaning paste, Ella said, “cheese”. Hmm…sorry Ella, no cheese flavor here. Ella tried again, “Heart flavor.” Too cute. She settled on chocolate. Seriously, this girl makes me laugh out loud! You must crack up all day ( you know, when you’re not pulling your hair out).